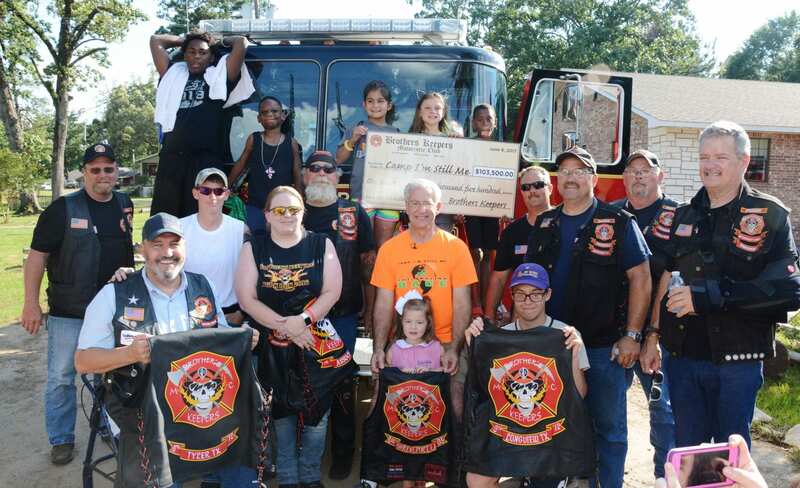 Members of Brother’s Keepers Motorcycle Club donated a check for $103,500 to “Camp I’m Still Me” in Scottsville, Texas, Tuesday afternoon to help children who have suffered various degrees or areas of burns on their bodies to enjoy a week-long camp together. At camp, they can let loose and be themselves without worrying about what others think of them and their burn scars. Chapter 1 of Shreveport, Chapter 13 of Longview, and Chapter 18 of Tyler donated the proceeds from burn runs they held in Shreveport and East Texas. Brother’s Keepers Motorcycle Club comprises all firefighters, whether paid, volunteer or retired, as well as their spouses. The group met at David Beard’s Catfish Village in Waskom, Texas, and then headed out to the burn camp at 5 p.m. Tuesday. Also helping were bikers from other motorcycle clubs, including Soldiers for Jesus and Bikers Against Child Abuse (BACA), as well as area fire departments. When they got to the burn camp in Scottsville, they presented a check for $103,000 to Dr. Kevin Sittig, Burn Center Medical Director at University Health in Shreveport, who started “Camp I’m Still Me” 26 years ago. He began the camp with 14 children, and today, he supports 70 children aged 4 – 17 at the camp, without any costs to the burn victims. In addition to presenting the check, the group also presented the camp kids with new bikes and toys and played games with them. Brother’s Keepers motorcycle club formed the 1st Chapter of Brother’s Keepers Motorcycle Club in Shreveport in 2003 for the purpose of having fun and riding our bikes. They now have 20 chapters in 6 states, 1 in Canada and 1 in Australia.